Home of the 2008 state Little League baseball and softball tournaments. Coverage of the Pequot Football Conference and Avon High. Your online home for the 2008 state field hockey coaches poll. BRISTOL, Aug. 18 – It was about three weeks ago and the Bristol American Legion baseball team was stunned and slightly embarrassed. After 20 wins in 24 Zone 1 contests this summer, Post 2 didn’t look sharp in a four-run loss to upstart Madison to miss the double elimination portion of the Connecticut state tournament. But Bristol had a second chance as host of the Northeast Regional. And Post 2 made the most of its opportunity. Bristol gave up a four-run lead Monday night against Booma Post 6 of Portsmouth, N.H. but rallied with two runs in the top of the seventh inning to win 5-4 and earn a trip to the American Legion World Series. 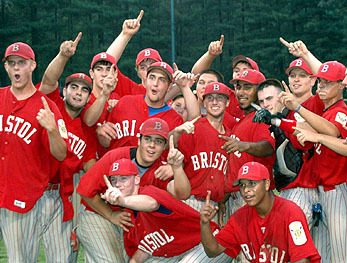 It is Bristol’s state-record fourth trip to the World Series and the first since 1997. Bristol is the first host team to win the Northeast Regional title. Trailing by one in the seventh, Tim Georgen reached on a bunt single and moved to second when teammate Dave Casanova was caught in a rundown and thrown out. Geoff Pierce followed with an RBI single to tie the game at 4-4. Pierce was thrown out on a fielder’s choice by Steve Clout, who moved to second on an error. Clout scored on Marco Ross (3-4, 2 RBI) RBI single for the game-winning run. Bristol P Mitch Ross scattered 14 hits but went the distance, allowing just four runs (two earned), striking out nine and walking just two. Bristol (24-6) went 4-1 in the tournament with some outstanding efforts. They outlasted Nova Seafood from Portland, Maine in 11 innings, coming from behind to earn an 11-10 victory, scoring the winning run when a Maine OF lost the ball in the sun. Bristol trailed 5-0 after two innings but rallied with an 18-hit attack and six innings of shutout relief from P Matt Niedzwiecki.